Each of Goddess Durga's nine forms, represented by the nine days of Navaratri, also have important lessons for investors. The festivities of Navaratri are underway and it is undoubtedly a festival of colors, lights, and dance. But, have you wondered about the larger significance of the nine days of Navaratri? It is actually representative of the nine forms of Goddess Durga with each form representing a unique characteristic. It not only depicts the quintessential features of Indian women but also the nine traits that make the world go around. Interestingly, each of these nine forms represented by the nine days of Navaratri also has important lessons for investors. Let us learn investing the Navaratri way. This is the first day and the first of the 9 forms of Navadurga. Shailaputri is the daughter of King Hemavana, the king of the Himalayas. She represents purity in its highest form and is also an embodiment of devotion. The investment analogy is that your investment strategy must be based on a core philosophy and as an investor you must stay devoted to this core philosophy. It is basically the theme that defines your investment contours. Like this pure form of Shailaputri, every investor must constantly display a continuous devotion to the core investment philosophy. The Brahmacharini form is one of the most magnificent manifestations of Goddess Durga and symbolizes the peace and bliss that stems from austerity. Austerity in terms of investing can be understood as a kind of discipline that has to be the core of your investing strategy. Whether you are a trader or an investor, discipline with respect to stop losses, targets, rulebooks are an absolute must. This is the only way to maintain your mental peace in the wild and volatile world of investing. This third manifestation of Goddess Durga has the symbol of the moon on her forehead. It also shows the Goddess with 10 hands which represents the ability to multitask among different roles and handles different situations. Each of these symbols has serious implications for investors. To be a successful investor, you need to keep your mental tranquillity and avoid panicking in the worst of situations. Also, the ability to multitask is key to an investor because you need to have a full grasp of research, execution, and risk management, all at once. This is another popularly worshipped form of Goddess Durga. She is revered as the creator of life or in other words, the one who brought light into the dark universe. Like the form of Kushmanda, investors need to be able to see reason and insights through the most volatile of situations. The world of trading and investing can be quite confusing as you juggle multiple challenges. Like the Goddess of light, the investor must be able to use the light of his knowledge and understanding to dispel the shadows of doubts and skepticism. The fifth form of Skandamata refers to the mother of Lord Skanda or Lord Kartikeya as he is popularly known. She is revered for her leadership qualities which is why she was appointed by the Gods as the commander-in-chief of the army in the war against demons. The greatest requirement of an investor is to think and behave like a leader. The buck stops with you and you alone. As the commander-in-chief of your investments, you alone are answerable. Markets will be uncertain and risks will be rampant. How you manage these risks and take calls by thinking on your feet will determine your success as an investor! 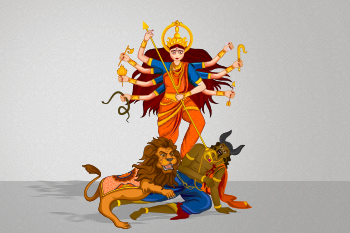 This sixth form of Goddess Durga is fearsome yet benevolent. Nothing can hide from Katyayani and her light is considered to be all pervasive. It is said that her vision is so powerful that nothing misses her eye. As an investor, you need to have your ear to the ground and have an eye for detail. Be it investment opportunities or investment challenges, they are always visible to the discerning. Develop the ability to throw the light of your investment insights so nothing really escapes you, neither opportunities nor problems. Kalaratri is that form of Goddess Durga which is worshipped as a benefactor and also feared as a protector. Kalaratri is known to be benign when good is done and destructive when she sees evil. This form of Goddess Durga also represents the ability to take quick decisions without hesitating. This decisive approach is a big advantage for any investor. There are times when the investors, like the Kalaratri form, have to take hard decisions. When it comes to choosing the right stocks and disposing of the wrong ones, the investor needs to be decisive and also ruthless. The eighth form of Mahagauri is one of the most subtle and endearing forms of Goddess Durga. It is believed that praying to Mahagauri gives people Mukti (liberation) from all sins of the past and present. For an investor, the Mahagauri, or the eighth form, represents the internal catharsis, unlearning, and relearning that every investor has to go through. It is okay to be wrong when you are investing but it not alright to stay wrong. Hence, a constant process of introspection and calibration of ideas is required. This is what makes great investors sustain their performance for long periods of time. This ninth form of Goddess Durga is celebrated as Siddhidatri and is celebrated on the ninth day of Navaratri. This form of Goddess Durga is known to bestow insights and perpetual wisdom in her worshippers. You must be wondering how the form of Siddhidatri is relevant to investing. It underlines the role of providence and divine grace in our investments. Even for the best of investors, there are some developments that are entirely out of their control. It is not about personal beliefs. It is about humility. Every investor must have the humility to acknowledge that even with the best of ideas and strategy, they can end up on the wrong side of the market.